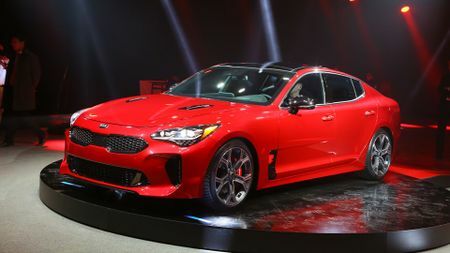 The Kia Stinger GT is a five-seat sports saloon that has been designed for spirited long distance driving, and is the most powerful production vehicle in the company's history. It’s a little longer than a BMW 3 series, but shorter than a 5 series, and looks both muscular and athletic, thanks to a long bonnet, blistered arches and quad pipes. The front air curtains, wheel arch gills, smooth underbody, and integrated rear diffuser are all functional design elements, too. It isn’t super-saloon fast, but it’s mighty brisk: think Audi S4, rather than RS4. Under the vented bonnet is a twin-turbocharged, 3.3-litre V6 petrol engine, estimated to develop 365bhp at 6000rpm, and 376lb ft of torque. Hooked up to an eight-speed automatic gearbox, complete with paddle-shifters, 0-62mph can be dispatched in 5.1 secs, and the Stinger GT will accelerate on to a top speed of 167mph. Can it also go round corners? This being a static unveil at the Detroit Motor Show, we can’t say, but the ingredients look very positive. The ride and handling development has been looked after by a bloke called Albert Biermann, who used to head up BMW’s ‘M’ performance division. 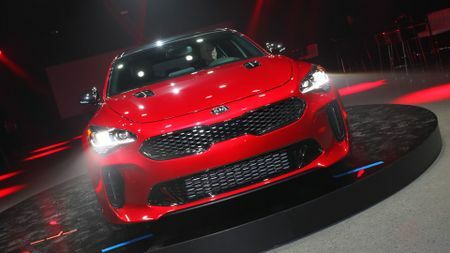 That may help explain why this car has been developed at the legendary Nurburgring circuit – a right of passage for any performance car – while it also features adaptive dampers and five driver modes (Personal, Eco, Sport, Comfort and Smart) to tweak the steering, suspension, engine and gearbox response accordingly, both systems of which are firsts for Kia. 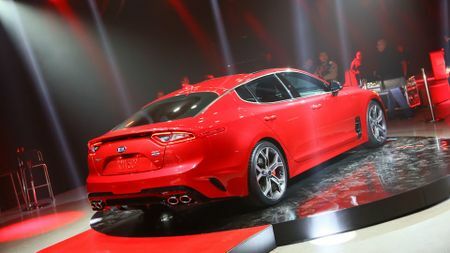 Can Kia build a credible sports car to rival Germany’s finest? Based on this evidence and the team behind the Stinger GT, we reckon so. A gran turismo is for driving long distances, so it will need to offer performance, luxury and comfort. That will manifest itself not just on the big engine or the nappa leather, but in the technology, such as the touch-screen infotainment, the wireless phone charger, the optional Harman Kardon audio system with under-seat subwoofers; and the raft of safety equipment such as autonomous emergency braking, adaptive cruise control, and lane keeping assistant. Will there be other versions available? Yes. There will be two flavours of Stinger GT: a rear-wheel drive version, and a four-wheel drive version. Plus, a less powerful Stinger will also go on sale, featuring a turbocharged 2.0-litre petrol engine that will produce 251bhp at 6200rpm. 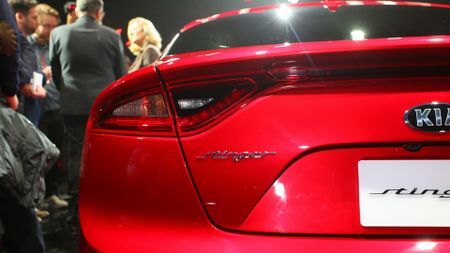 A full range of non-sporty models are expected to follow suit, too. We’re expecting UK sales to commence in October 2017, with prices for the Stinger GT starting from £37,000. 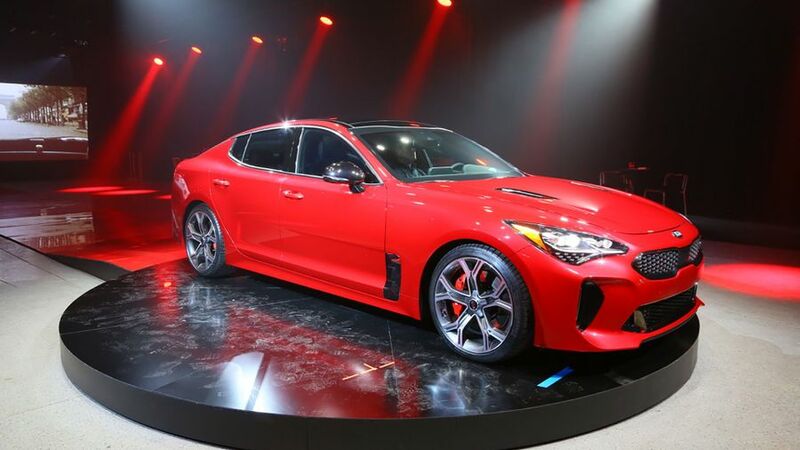 Interested in buying a Kia Stinger?